OK, gaming. 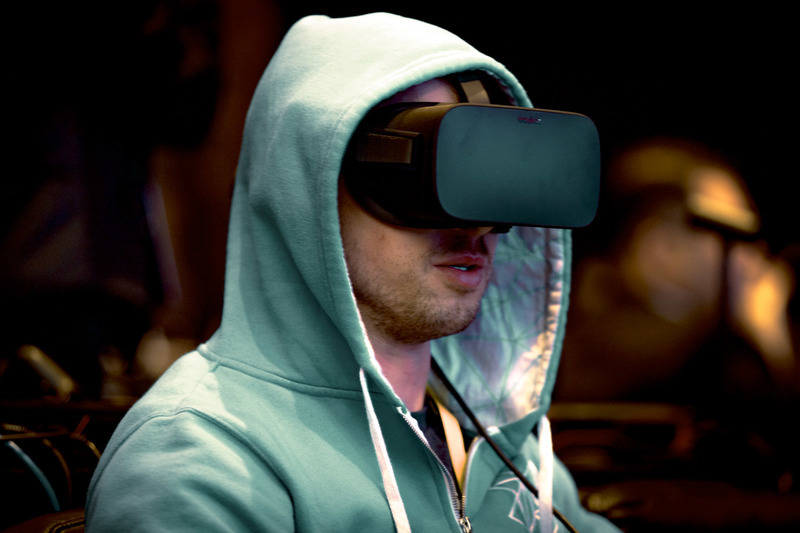 This is the first answer for "what's the biggest thing in VR?" 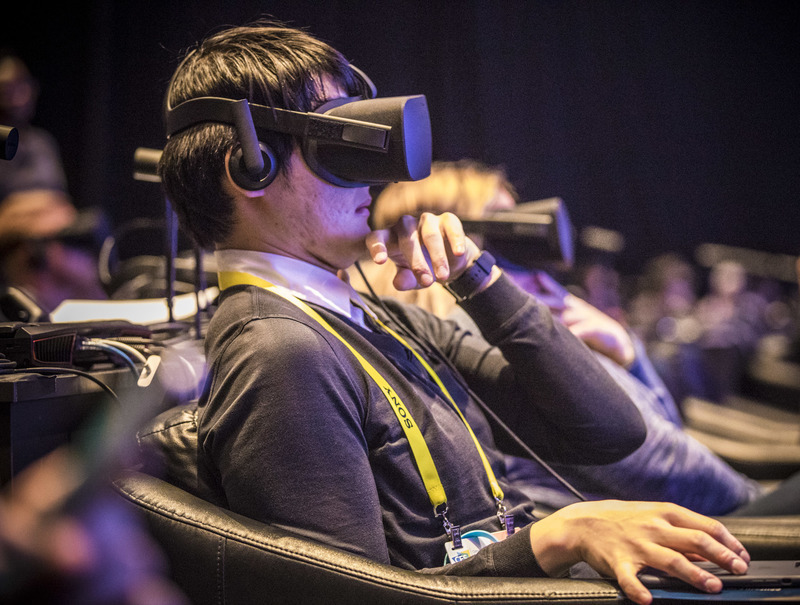 But Intel wants to go a step further, making it possible for you to interact with the virtual and real worlds. 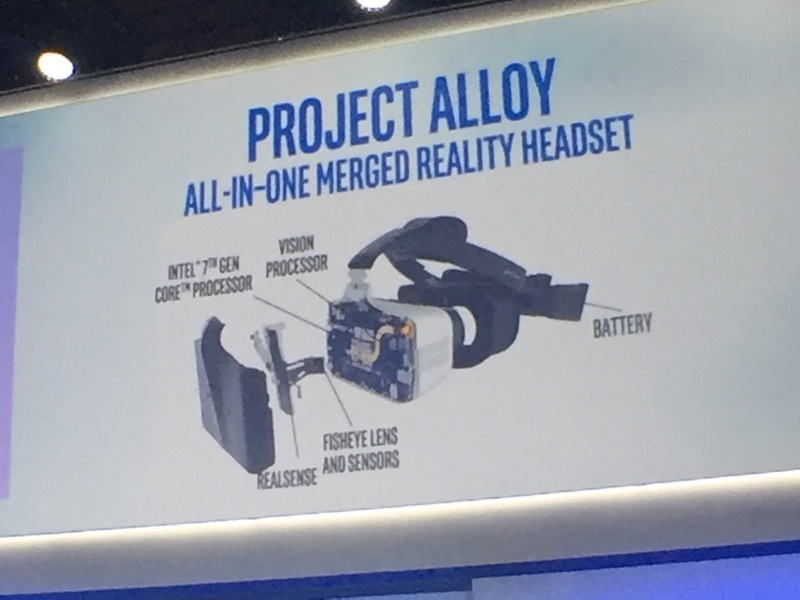 Merged reality uses Intel's RealSense cameras and Project Alloy headset to provide a cordless, immersive VR experience. 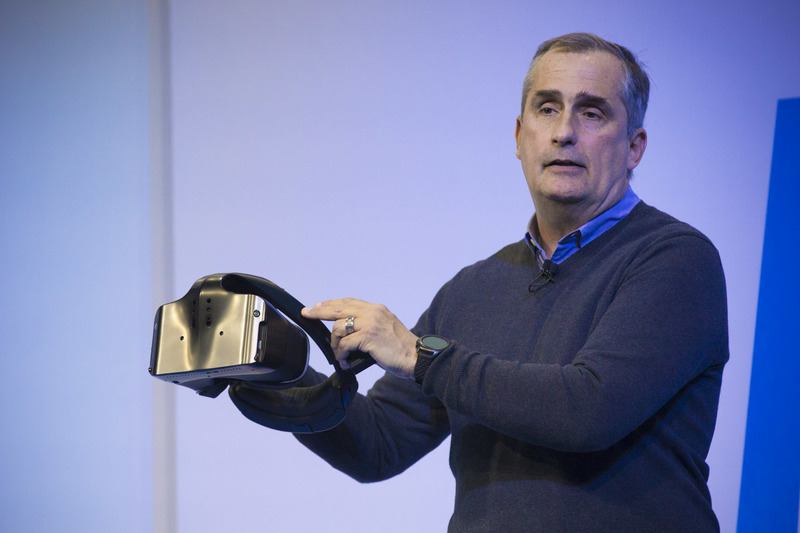 Project Alloy was first shown off at Intel's developer conference last year. The stage opened up to a living room setup. I got to try a Project Alloy prototype (admittedly a fairly early one) late last year. It was pretty good at letting me see a bit of the real world around me, but pretty terrible as a VR headset. Not so immersive. There's small print at the bottom of the screen as we're watching. "This device has not been authorized as required by the rules of the Federal Communications Commission. This device is not, and may not be, offered for sale or lease, or sold or leased, until authorization is obtained." There are two guys inside the living room getting ready for...something. Radar, armor bunkers, plasma power supplies. The screen shows a gaming environment with the two players able to hide behind the couch, which is now a bunker. The room is part of the gaming experience. Players can see each other. 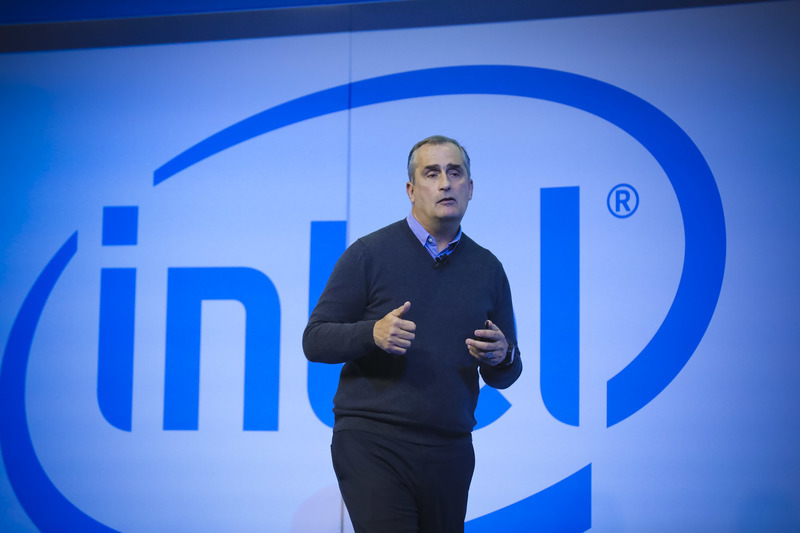 Intel has said it plans to start offering Project Alloy technology to its manufacturing partner in the second half of this year, so this tech shouldn't hit the market anytime soon. 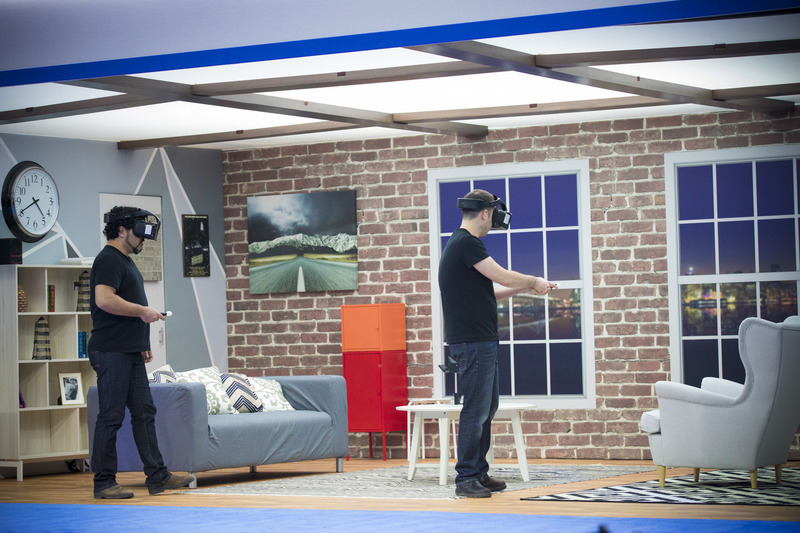 With today's VR headsets, you need to move your furniture out of the way or else you'll trip over things you can't see. With sensors like the ones Intel's pushing in Project Alloy, maybe your furniture could automatically be scanned and appear as objects in the game world. 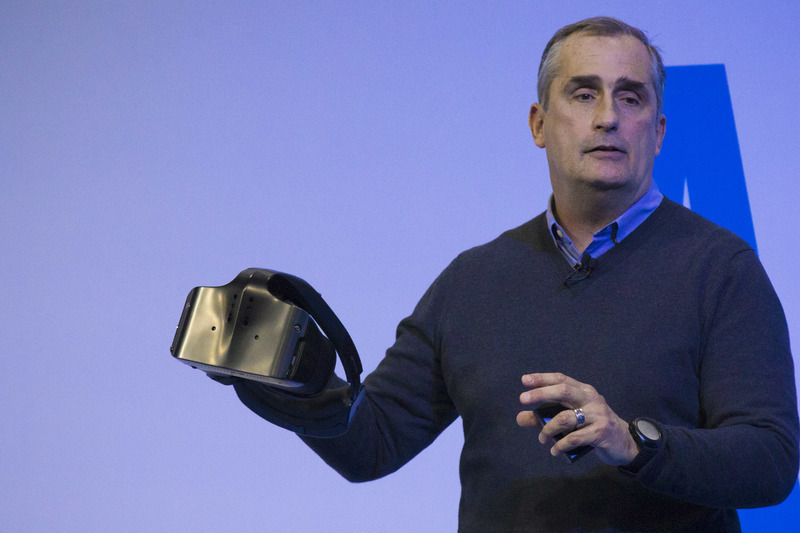 And Krzanich just said intel will "productize" Project Alloy with its manufacturing partners by the fourth quarter of this year. What the heck does "productize" mean? That means maybe companies (other than Intel) will make these products and eventually sell them to you. Yeah, that's a new one! Don't expect it to be on store shelves. But it's leaving the R&D lab. But, I'm not sure it means Project Alloy-powered headsets will be for sale by the end of this year. Yep, what Ian just said. Want to see what's inside Project Alloy? We've got a cool slideshow complete with animated exploding GIF. OK, we're gonna see a gory zombie game. "People have gotten a little queasy at it." Hence the barf bags. Can't deal. Freaking out already! It's called Arizona Sunshine. I've played it, and it's pretty immersive... definitely need a Vive or an Oculus with three sensors (so you can stand up, walk around, turn 360 degrees) to really enjoy it, though. Basically, a bunch of zombies coming at me...not good not good not good. As expected, a zombie gets you at the end. Except, uh, in the actual game you have guns and you shoot at the zombies. 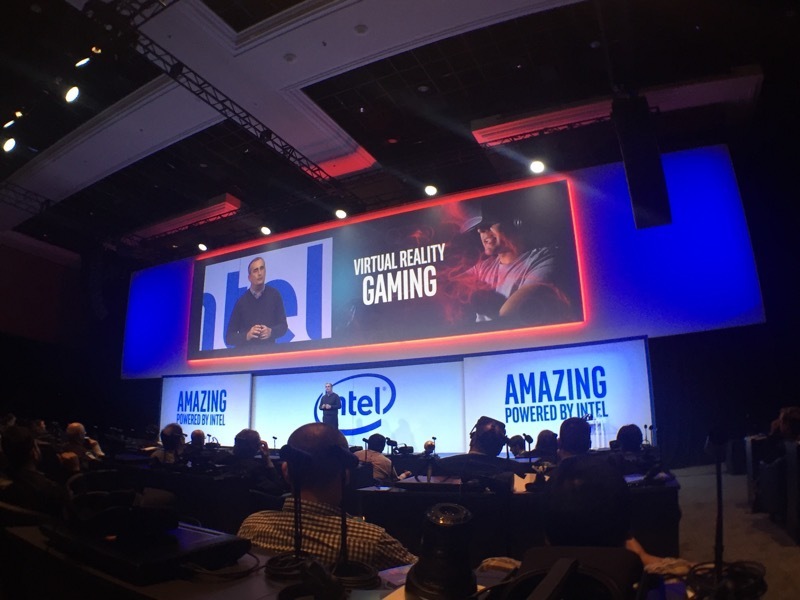 Intel's just letting the zombies eat people? Good news: Pretty sure no one has needed a barf bag here yet! Sean, it's a trailer. We just see zombies walking around with eerie music. 2017 is off to an amazing start. We're going back to the basketball game. Geez, I hope I get some frequent flier miles for this...here all day, folks. What's interesting is that after years of becoming photorealistic, the zombies look kinda pixelated. The games suddenly look like they did more than a decade ago. I get it, computing is hard. But think like a normal consumer: They walk around Best Buy, see Uncharted 4 and how beautiful it is, and then they try on a VR headset with a comparably blocky character. What do they say? It's a great point, Ian. And I can tell you that, lucky guy that I am with a house full of VR headsets... I'd usually rather sit down with a regular game with a big budget, a story, and crisp graphics. There's no money for those polished games in VR yet. We are courtside, watching the live feed of the game. "This gives you a first touch of where this is headed with sports." KRZANICH JUST SAID THEY ARE WORKING ON A T-SHIRT CANNON TECH. AN UBER DRIVER WILL DELIVER A T-SHIRT TO YOUR HOUSE IF YOU "CATCH" THE T-SHIRT AT THE GAME. Dude, can this get any more Silicon Valley? It's so crazy I kinda love it. Folks can play the zombie game after the show. Looks like we're wrapping up here. That was a wrap, everyone. 53 minutes, a bunch of demos in different places. Definitely a different kind of press conference. Get ready for that T-shirt cannon, people. Ben just said this was a piece of CAKE. Get it? Hahahaha. Cake. Oh, Ben. You crack me up. Ok y'all, thanks for reading along. I wish you many happy days with a Cake by the Ocean in your new VR real-sense mixed reality 4K multitouch haptic feedback devices. Thanks for joining us, everyone. We're outta here.